Betterness - Audiobook | Listen Instantly! 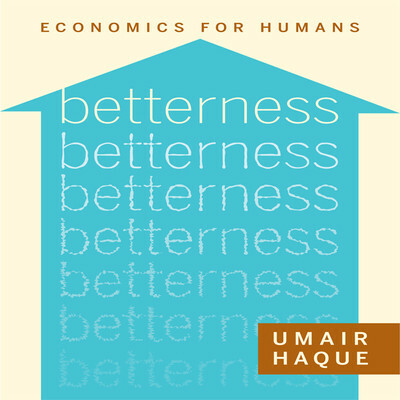 Betterness: Economics for Humans is a powerful call to arms for a post-capitalist economy. Umair Haque argues that just as positive psychology revolutionized our understanding of mental health by recasting the field as more than just treating mental illness, we need to rethink our economic paradigm. Why? Because business as we know it has reached a state of diminishing returns—though we work harder and harder, we never seem to get anywhere. This has led to a diminishing of the common wealth: wage stagnation, widening economic inequality, the depletion of the natural world, and more. To get out of this trap, we need to rethink the future of human exchange. In short, we need to get out of business and into betterness. Download and start listening now! Umair Haque, consultant, author, and blogger, is director of the Havas Media Lab and the author of The New Capitalist Manifesto: Building a Disruptively Better Business. He is also the founder of Bubblegeneration, an agenda-setting advisory boutique that shapes strategies across media and consumer industries. Walter Dixon is a broadcast media veteran of more than twenty years’ experience with a background in theater and performing arts and voice work for commercials. After a career in public radio, he is now a full-time narrator with more than fifty audiobooks recorded in genres ranging from religion and politics to children’s stories.